YouTube is the World's biggest and video sharing website . YouTube is not only a place where you can watch movie Songs, movie and movie trailor, comedy video etc. YouTube could be a very Good place for learning as well . YouTube Brought up YouTube EDU for students Global Educational Classroom on YouTube www.youtube.com/edu. Google very excited to welcome many new colleges and university partners and a few enhancement that will help you discover the wealth of educational material that they provide. the global educational classroom on YouTube (www.youtube.com/edu) could be very Good place for those students who are self learners especially in India it would be very beneficial for for students who are receiving professional education Like AMIE, IETE, Aesi CA etc. The open educational video movement is a worldwide phenomenon. Google very excited to announce that www.youTube.com/edu include universities from UK, France, Spain , Italy , Nether land, Russia and Israil.Cambridge University , Open University Bocconi University and Open University of Catalonia are among 45 new addition who have opened their doors to a global audience of students , Teachers, alumni and self learners, number of universities from US and Canada now start participating on YouTubeEDU program. www.youtube.com/edu currently providing 40,000 videos of lectures , News, and Campus Life. YouTube recently highlighted lecture series from Columbia University and the Seminal Course " Justice" from Harvard University. www.youTube.com/edu is a international classroom therefore YouTube is provides language menu so you only receive videos that you understand, if your www.youtube.com/edu language is set to English, you will See YouTube EDU videos in English . You can Change the language of Youtube Edu video at anytime or even set languages to all for the full spectrum. 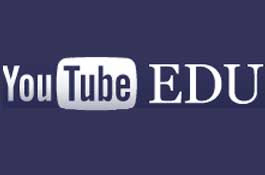 As YouTube EDU contain lots of lecture video therefore YouTube provides the ability to browse by subject such as Engineering , Business and Literature. Currently this feature is available inEnglish only but Google is looking ahead to expand it into other languages as more universities come on YouTube EDU.